Patrisse Cullors explores why the laws that are supposed to protect us are usually used against us. A case in Detroit raises several issues that are important to me in this moment. Siwatu-Salama Ra, a 26-year old pregnant, Detroit mother and community leader was just sentenced to two years in prison. Last July, while she and her toddler were visiting her mother, Siwatu was confronted by a neighbor. The neighbor rammed her vehicle into Siwatu’s car while her two-year old was inside and then tried to use the vehicle to run Siwatu and her mother over. Fearing for their lives, Siwatu, who is a licensed concealed gun owner, held her weapon in plain sight, hoping it would stop her neighbor from running them over. The weapon was unloaded and no one was hurt. Siwatu didn’t have any intention of using it. She was not engaging or thinking of engaging in deadly force. All she wanted to do was to protect herself and her family and defend herself without causing injury to any other person. Michigan has a specific law, popularly known as the Stand Your Ground law to protect people who act by using a firearm to defend themselves from another person who they believe is going to cause unlawful harm to them if there is “an honest and reasonable belief that force is imminent.” However, instead of the law working for Siwatu, it was used against her. As President Donald Trump swings wildly in his positions—everything from arming teachers to taking guns away without due process, Black gun owners know that very little in the public debate speaks to their issues. Case after case, we are reminded that legally owning a gun if you’re Black doesn’t guarantee your right to self-defense and may land you in jail or the morgue. From high profile cases like Marissa Alexander to Philando Castile, we are reminded the Stand Your Ground Law is an empty, cruel joke. JusticeLA – Parental Incarceration from Cecilia Sweet-Coll on Vimeo. Does the second amendment apply to us? This double standard can be traced back to the founding of our country. When our most famous self-defense legislation was signed into law, the second amendment only applied to white, property-owning men. While the law changed, the underlying fear of armed Black people never ceased being the foundation for almost any conversation Americans have about guns. When Black Panthers rallied in Sacramento wearing unloaded rifles, the NRA lead an aggressive gun control reform campaign. Definitive gun ownership stats are hard to find, however in recent years the Pew Research Center has found that African Americans’ perception of gun ownership has drastically changed. A 2012 Pew survey found that less than a third of Black of households viewed gun ownership as positive. However, by 2015, another Pew study found that 59 percent of Black families saw owning a gun as necessary. Siwatu’s story is just one of many that shows if a Black woman asserts her rights and arms herself from potential violence, she is putting herself at risk of being criminalized, prosecuted and incarcerated. Due to the racial and gender biases that plague our criminal court system, women of color are the fastest growing population in U.S. prisons, and they are twice as likely to be incarcerated than their white counterparts. Those dismal prospects only apply to Black women who aren’t pregnant. For women who are with child and find themselves behind bars, the situation is even more dire. While there is no current data for pregnant women who face prison time, in 2004 the Bureau of Justice Statistics found that 3 percent of women in federal prisons and 4 percent of those in state prisons were pregnant upon arrival. In all likelihood that number has continued to rise over the last decade as the number of Black women in prison has risen. Siwatu is now incarcerated. She is one more woman added to this unknown statistic. Currently five months pregnant, Siwatu is not only fearful of having to serve time but also giving birth while in prison. She has all the right to be. There is very little data on the kind of medical care pregnant prisoners receive, but these women prisoners have said that at best, the quality and timing is inadequate and at worst it is harrowing. After already going through one high-risk pregnancy, Siwatu’s doctor warned the judge of the serious health threats she will face while in prison. In addition to the usual stressors that all incarcerated women face, pregnant women are at risk of further mistreatment from correction officers, traumatizing strip frisks, poor housing conditions, insufficient emotional support and inadequate amounts of food. And when they do have their baby, in most states, the infants are taken away from their mothers in a matter of two to three days after the birth. In the few days since her trial, Siwatu has already reported that she has not received water after asking for it multiple times. Siwatu’s legal team will be pursuing various tactics, including requesting she be released pending appeal, reversal of the conviction, and a commutation and/or pardon. 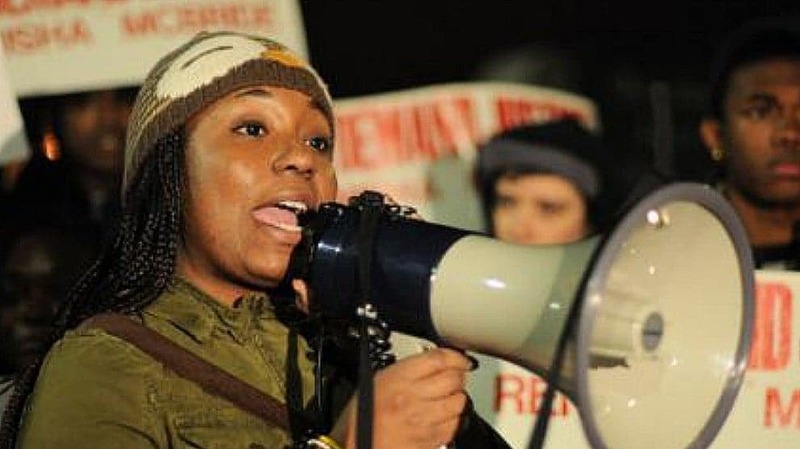 Local Detroit activists, who’ve known Siwatu through her environmental justice and youth organizing work for years, are demanding the abolition of all mandatory penalties, which remove all discretion by the sentencing judge. We can’t expect gun lobbyists to come to this Black woman’s defense for standing her ground and we know that anti-choice activists will never lift a finger to prevent an unborn Black child from going to jail. Siwatu’s case only highlights the linked contradictions of these two right wing movements. We must take on her case ourselves and navigate within a criminal justice system that unfortunately continues to be steeped in hypocrisy.